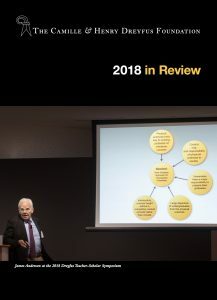 The Camille & Henry Dreyfus Foundation 2018 Year in Review is now available. This brief report includes information about the Dreyfus Teacher-Scholar & ACS symposia, the 2019 Dreyfus Prize, the revised Dreyfus Web site and video library, Dreyfus lectureships at undergraduate institutions and the University of Basel, 2018 award recipients, and 2019 program deadlines. Read it by clicking here or on the cover image above.